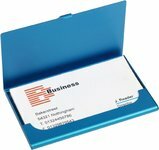 Branded business card holders are a great marketing tool. These card holders can be screen printed with your logo or engraved. 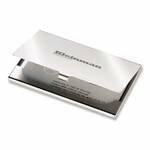 Business card holders are for anyone who wants to make an impression when they meet someone and are an ideal giveaway for business related functions and events. Do you supply eco-friendly business cards? We can supply business cards made from environmentally friendly materials in the form of recycled paper and cards or reclaimed plastics. Can you supply non-standard business cards? We can cut and print non-standard card and shapes and even supply double opening cards to help you make an impact. Can you supply plastic business cards? We can supply business cards made from plastic and these can be clear or have a solid or frosted plastic finish. This type of business card can also be thicker and more hard wearing than a traditional paper card.